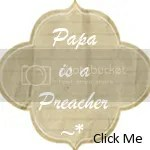 On Sunday I received a message from Gabby asking if I’d mind if he added PapaisaPreacher to his recommended blogs page. I happily said yes and immediately remembered that many bloggers have a little button on their blog’s sidebar that other bloggers can put onto their page. So I set out to make one for us. I came across several blog tutorials that where very well meaning but, very confusing. Until I found Oikology’s tutorial. It’s such a simple and fool proof tutorial and I’m so very thankful for it that I’d like to share it with anyone and everyone else who might be looking for help on creating a blog button. Click Here to be directed to her simple steps for creating a blog button. For any bloggers out there, please consider adding our little button to your page as well! The code is on the left side bar. And readers out there, that’s what the little square with a code underneath is for, for fellow bloggers to post our link to their page! Happy Blogging and button making y’all!